For years I have been wanting to make homemade vanilla extract. 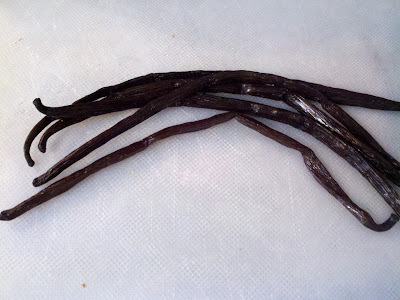 I never got around to ordering the Madagascar Vanilla pods that are highly suggested to be used in all the recipes. Maybe I thought they were too expensive and I couldn't rationalize paying shipping on top of it. Anyway, I put it on my wish list of things to do and forgot about it. Saturday I visited a new favorite spice store. This place smells wonderful before you even step in the door. What do you know, they had a jar of fresh Madagascar pods sitting on the shelf behind the register. I bought 5. I have never purchased fresh vanilla beans before and wasn't prepared for the overwhelming wonderful smell they emit. Of course it smells of vanilla but this was so pure and fresh. If we had smell-a-net right now, your nose would be glued to the screen. I started with 5 beans. 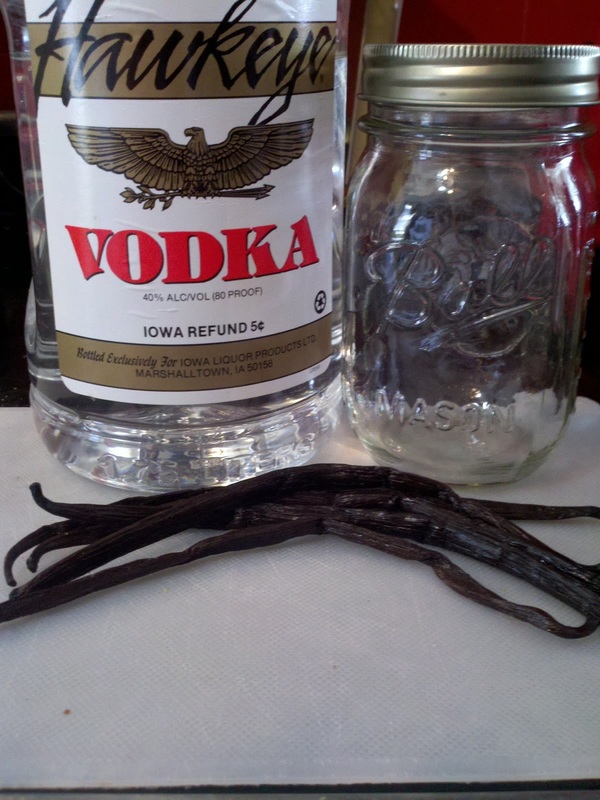 I took some bottom shelf vodka (from what I have read, vodka does not interfer with the flavor of the vanilla. You can use rum or bourbon should you choose.) You may notice that the end result is not in this canning jar. I decided to go with smaller jars after I took this picture. Begin by slicing open the beans. You will need 5 beans for 1 cup of vodka. Sealed the jars and set them on a shelf in my basement. Now the waiting begins. 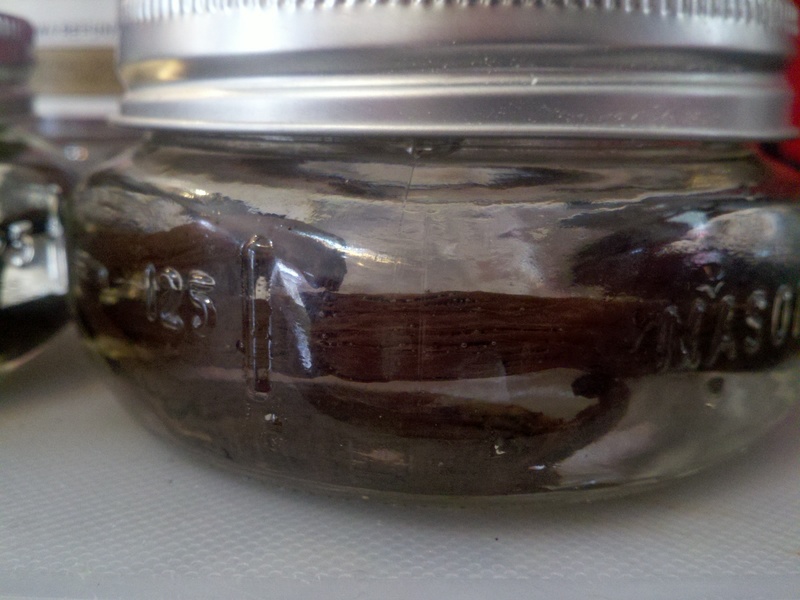 Once a week, I need to flip the jars and at the end of 8 weeks, the homemade Vanilla Extract will be ready to be used. I have read that you can replenish the amount that you use with more vodka. 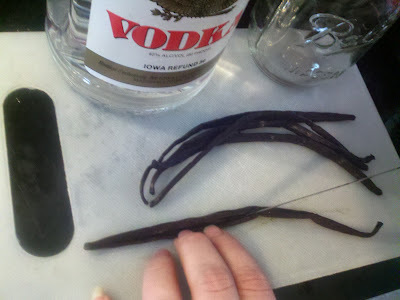 I will keep you updated on the progress of the vanilla extract over the next 8 weeks. It's that time of year again, the time where zucchini is coming in at full force. The time of year that you can check your plants one day and see nothing then the very next day, you find a mutant two footer. With the overgrown mutants, I love making Zucchini Relish. 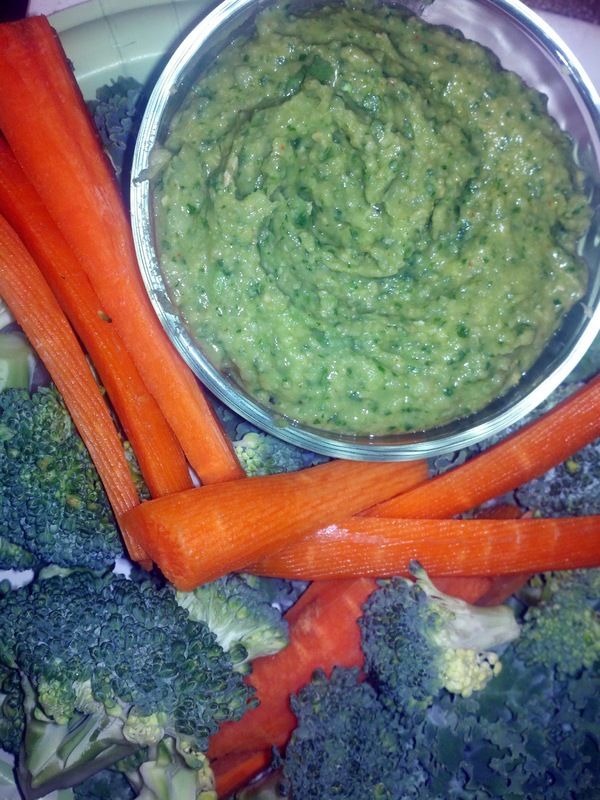 Quite a few of my blog visitors have asked about a low or reduced sugar recipe. Until today, I haven't had a clear answer as to what the taste impact would be by reducing the sugar. I started by reducing the amount of sugar by 1 cup (the recipe calls for 3 cups total). I let the complete mix process for 20 minutes and gave it a taste test. Typically I have a hard time staying out of the relish before its processed but not this time. I found the relish tart. Much too tart for my taste. I couldn't can it that way. My family would never eat it and it would go to waste. I figured I attempt to stay the reduced sugar route and added a 1/2 cup more. This made the recipe tolerable with a passable amount of sweetness. In my opinion, if you are wanting to reduce the amount of sugar, only reduce it 1/2 cup. Conclusion, even though I have tried to reduce the amount of sugar in other canning recipes, this one is simply not one to mess with. It is beyond good and the most excellent addition to any chicken, hot dog, hamburger and more. Here is the orginal recipe. It is wonderful and makes a wonderful gift...that is if you can part with it.